A quick note to let you know I released Veronica Speedwell on Ravelry today. Thank you all so much for your supportive comments in my first post – I am so glad you like them! Categories: Designing, Fair isle, Finished Objects, Socks | Tags: colorwork, designing, fair isle, Knitting, socks, Wool | Permalink. I have always been a little frustrated at the seeming lack of YouTube tutorials that explain how to create colour dominance in stranded knitting. 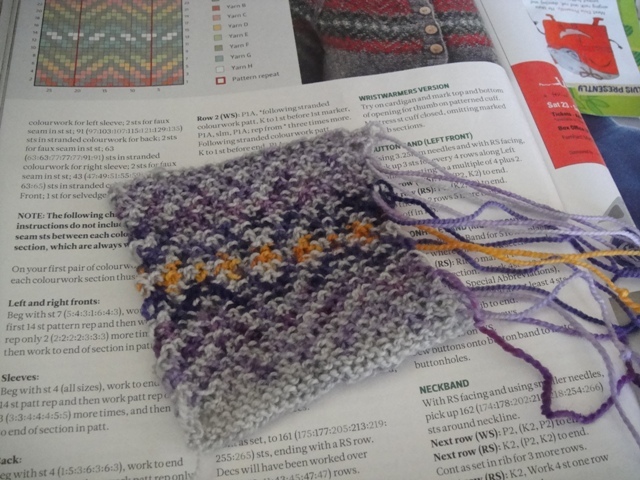 One would have been immensely useful to me when I was working out how to get my motifs to ‘pop’ against the background fabric when I was learning to knit fair isle/stranded colourwork correctly. I don’t address holding the yarn in this video. There are many, many YouTube tutorials out there on this subject, so feel free to explore them to find a method you prefer. 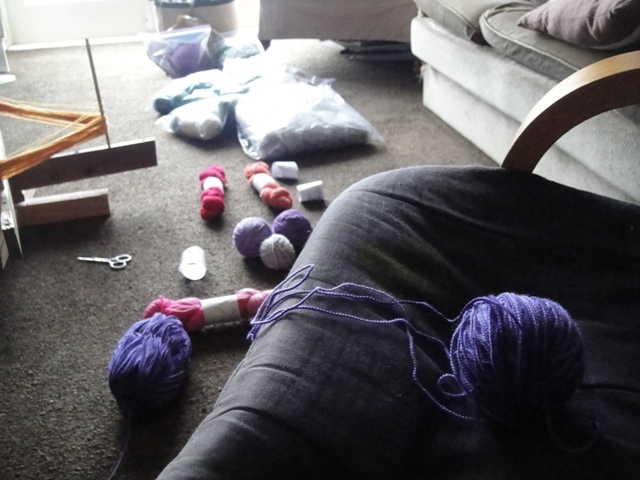 As you can see, my technique is the simplest – I carry the yarn one colour at a time. Categories: Fair isle, Knitting techniques, Tutorial | Tags: colorwork, colourwork, fair isle, Knitting, knitting tutorial, socks | Permalink. Today, for the first time in ages, I woke up without the weight of a deadline hanging over my head. It felt so good. I decided that with some free time on a rainy day, this would be a good opportunity to make further investigations into some projects that I’ve been eyeing recently. They are done! I love them so much. They’re at once very “Alice in Wonderland” and “Wicked Witch of the West” don’t you think? I’m looking forward to refreshing my stocks of Happy-go-knitty next Saturday at the Wellington Underground annual “Wonders of Wool” market. 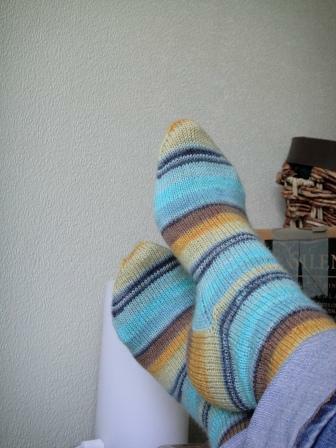 More, pretty stripy socks coming my way! 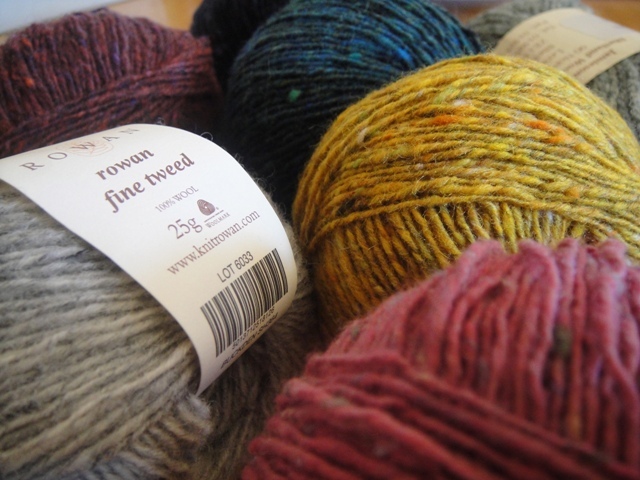 Funny how we knitters talk about yarn in terms of a finished project. Seven glorious hanks of Knitsch Milky Way, for the knitting of the Southern Companion were ready for my pick-up! 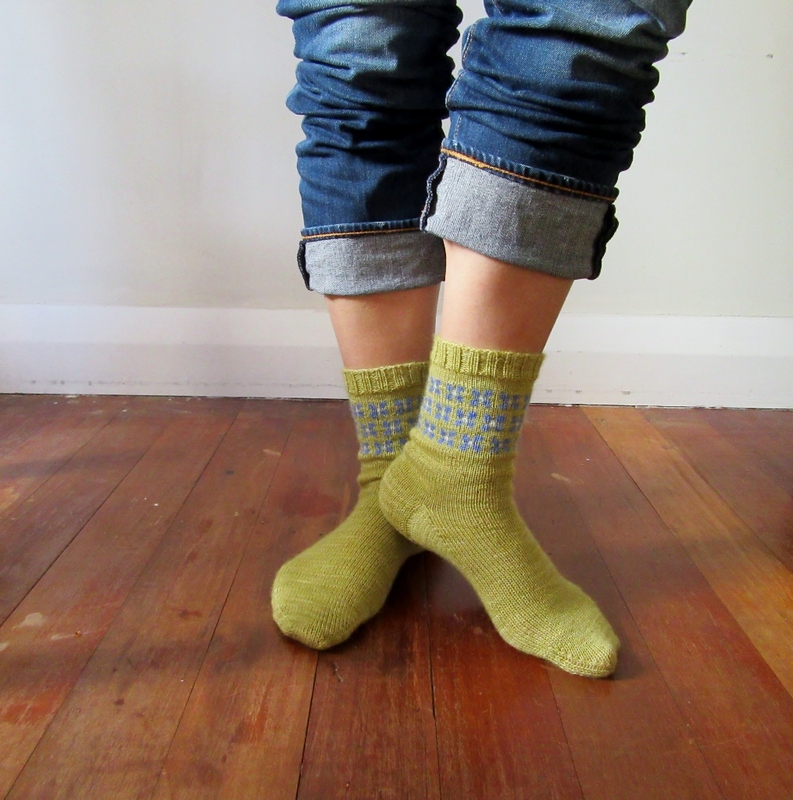 It’s called Conifer (designed by Rosee Woodland), and it’s in Issue 54 of The Knitter. 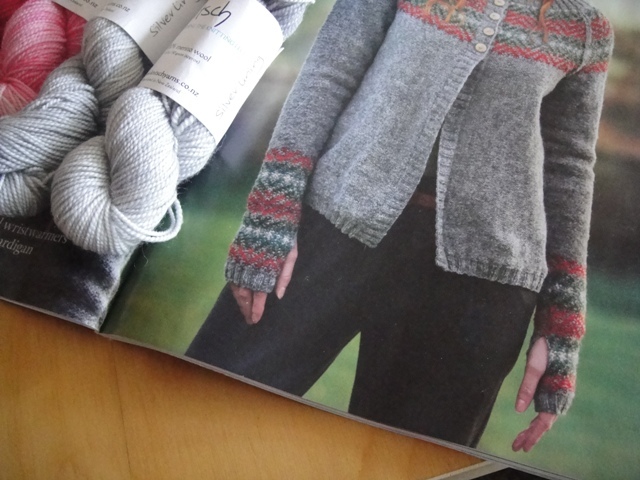 Several features attracted me to it: the knitted-on fingerless gloves (very handy to keep those winds out of one’s sleeves) and the fact that it’s knitted in reverse stocking stitch. The certain someone I’m knitting it for likes to wear her sweaters inside out because she prefers the smooth feeling of the stocking stitch instead of the purl bumps. This would be perfect! The final feature I liked was the unusual reverse fair isle. 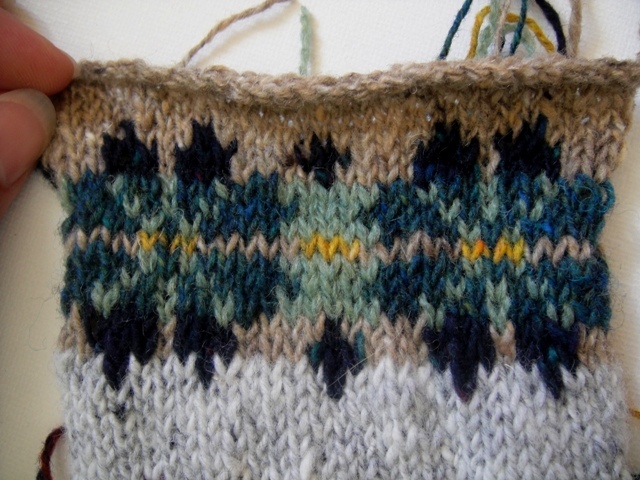 I’ve been thinking about using reverse fair isle in a pattern, and this looked like a good opportunity to try it out. 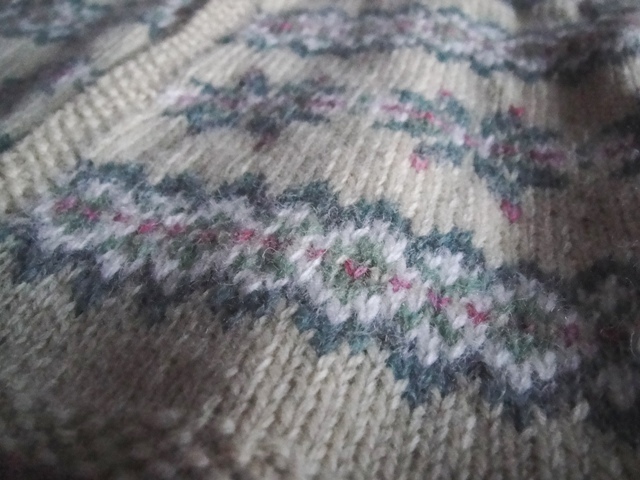 I also had in mind a certain person’s comment about knits in the English town she lives in “Oh, fair isle is so common, everyone wears it, it’s not special to me any more.” Perhaps an unusual take on fair isle might be good? Something colourful for the yoke perhaps? However, as I was winding the balls, it occurred to me that while all those colours looked oh-so-pretty together, they might seem cartoonish all in one garment. I’m not sure about that gold, but the purples looked good. The only downside was that when I measured the swatch, the gauge was far too small. Bother and horrors. 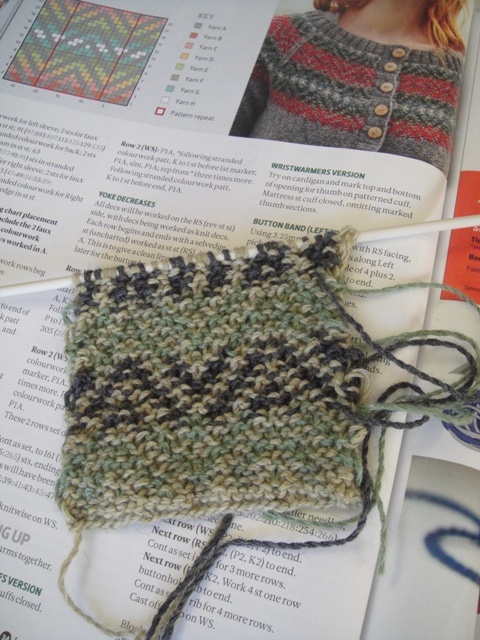 That swatch was a real brain-teaser to knit too! 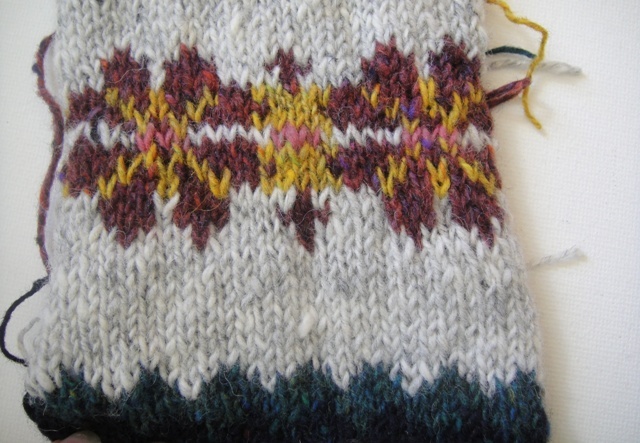 Reverse fair isle is tricky until you figure out that you can’t knit it like normal fair isle!! I sat there feeling annoyed. 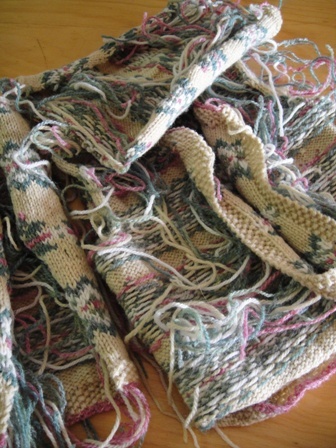 Knitsch was very much what I wanted to use. I didn’t really fancy knitting more swatches until I found a yarn that matched. 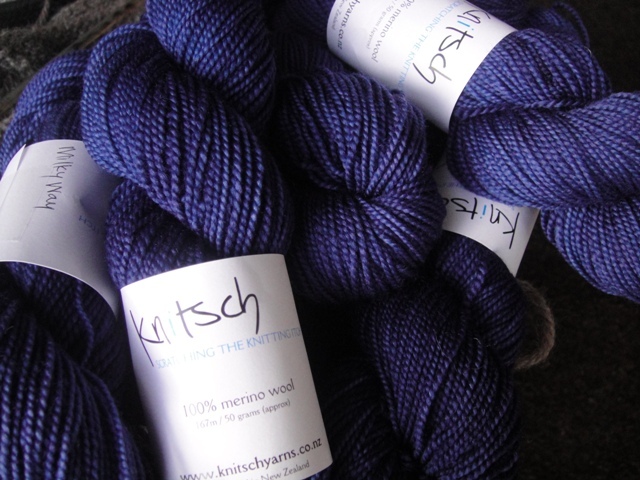 Besides, I don’t have any other yarn in my stash with that colour range. Why didn’t it match? They were both 4 ply after all!? They felt the same thickness in the hand. I decided that I would see how many wraps per inch the J&S was… 15 per inch. Then I wrapped the Knitsch, I found that it’s more like 20 wraps per inch! Ah. It made sense now. I should probably have done that first. Doh. I am pleased to say that it gives the exact gauge that I need for this pattern. Categories: Colour, Fair isle, Finished Objects, Inspiration, Knitting | Tags: fair isle, FO, Happy go Knitty, Knitsch, Knitting, New Zealand yarn, socks, WIP | Permalink. 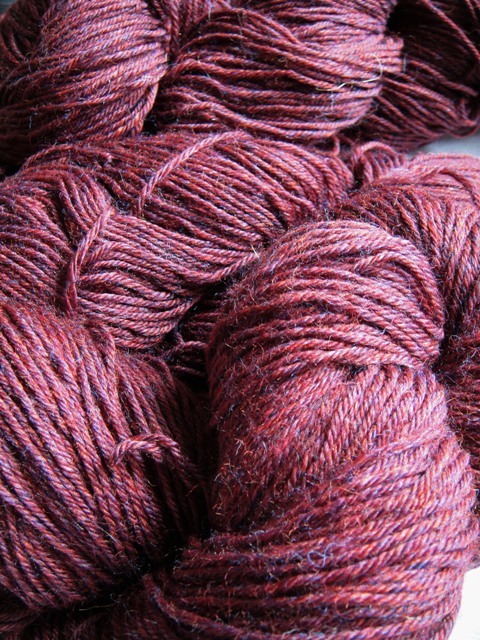 I’ve had this Jamieson & Smith 2 ply jumper weight yarn in my stash for quite a long time. Waiting for the right project. I’ve blogged about it before when I thought I might have found the right thing for it. I think I’ve finally (!?) found it. 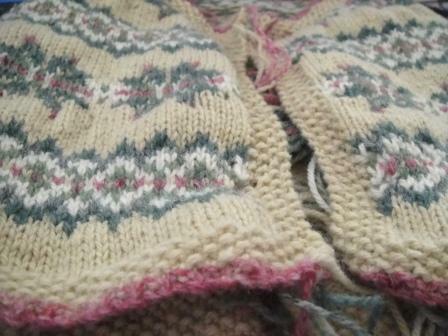 For quite some time I have also been searching for a fair isle project that I’d love to wear. That, combined with the classic feel and look of a traditional yarn like the Jamieson & Smith yarn merged into the perfect combination recently: Trefoil. It has the perfect amount of fair isle – just around the yoke – so that I don’t get bored of all that stranding, and it’s a lovely design. I started swatching before Christmas. After I’d finished, I wasn’t sure if it was right. The middle section looked murky. You can’t really see the flower pattern. 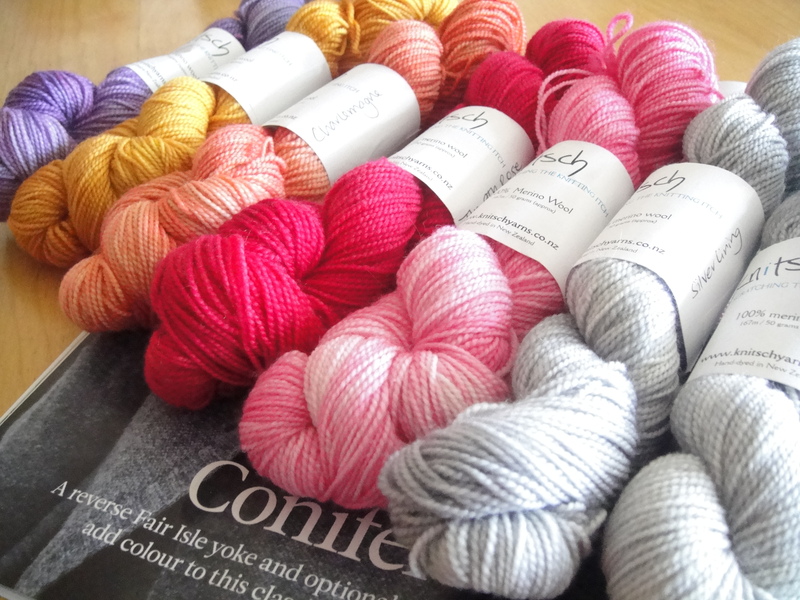 Frustratingly, I didn’t really have any other colours in my stash that were any better. I didn’t really have anything similarly textured and shaded (ie tweed or heathered) to match nicely with it. So now it looks like I’ll have to knit two of these. One for her, and one for me! The project swatch then sat in my ‘think about’ basket for a couple of months. If only I had more of that lovely Rowan Fine Tweed to play with! Ah, this one felt just right. It gave me that happy “twang” in the belly when I saw it finished. Do you get that when you know something’s just right? The colours tone with each other perfectly. I’m not sure if you can see it in the picture, but Askrigg, the deep blue, contains the same green and red flecks that are in both Wensley (the blue/green) and Settle (the plum). Buckden forms the neutral background, and I repeated the J&S colour (FC62) through the centre. They tie in perfectly. Magic! 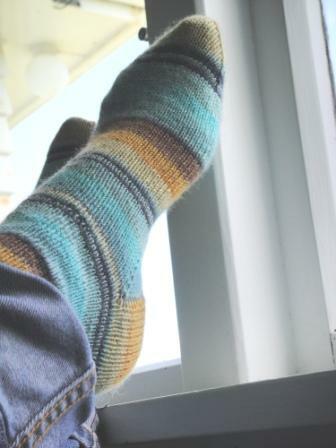 I finally remembered that fair isle colours work best if the colours are the same tone. Silly me. 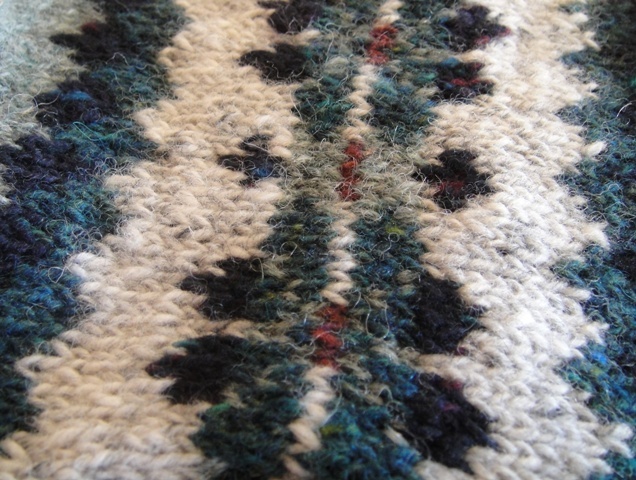 Categories: Knitting | Tags: fair isle, Knitting, Trefoil, WIP, yarn | Permalink. I don’t know if it is correct to call something “heartbreakingly lovely”. 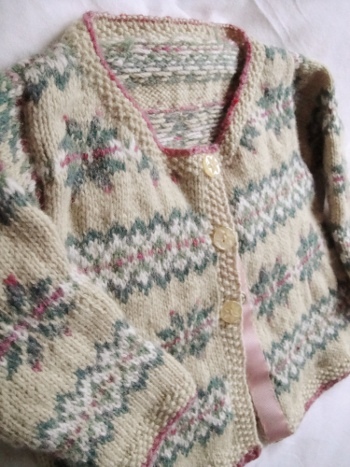 But in my opinion, this wee cardigan for my niece fits the bill. I’m so, so happy with it! I don’t know why it took me so long to gear up and knit the final sleeve. Perhaps I just didn’t want the project to end? It’s the colours that I’m particularly happy with. The combination of honey, cream, greens and pinks are so fortuitously harmonious. Even though I saved myself a lot of trouble by knitting this in one piece up to the armholes (as opposed to separate pieces), the millions of ends I still ended up with took a couple of evenings to sew in. Looking at this picture still makes me feel a little stressed…there.were.so.many!!!! 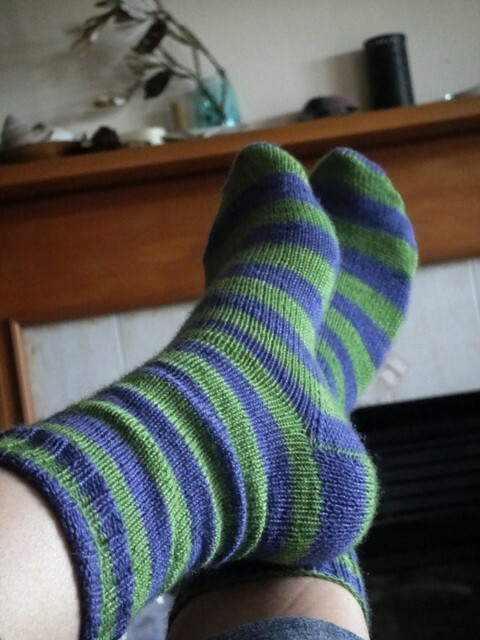 I have now decided that steeking is an excellent idea, and I shall be trying that out for my next colourwork project! I decided to forgo buttonholes, and used snaps instead, reinforced with ‘fake’ buttons and some pretty pink ribbon, to make it look ‘finished’ and give the bands strength. 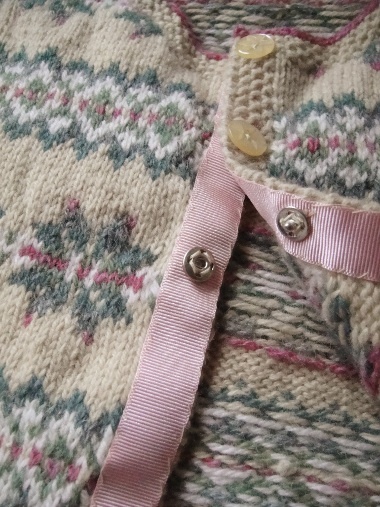 This cardigan is such a pretty combination of pure wool from around the world. There’s a bit of Jamieson & Smith Shetland jumper weight in 2 ply (greens), a bit of Rowan Scottish Tweed 4 ply (pink – thanks Kb! ), and some Australian eco merino (brand no longer available) in cream and honey. The pattern is from Debbie Bliss’ book Special Family Knits. It’s the Fair Isle Cardigan. Click here for my Ravelry notes if you’d like more details (I will post more photos to that page, but there’s an issue with loading photos to Ravelry at the moment for some reason). I can’t wait to see my littlest niece in this one. Categories: Finished Objects, Knitting, Wool | Tags: cardigan, Debbie Bliss, fair isle, FO, Jamieson & Smith, Knitting, Wool | Permalink. I was going great guns on the cardigan. The body is done and one sleeve almost finished. But somewhere along the line, my interest waned… I blame the socks. They were, um, slightly addictive. To make myself feel better about not finishing my niece’s cardigan yet I went looking for, and found, all the items of haberdashery I need to finish the cardi (a little bit of pretty ribbon and some buttons). I figure I’ll pick up the needles again tonight. I have also cast on for this (Gemma). It has taken me a while to find the pattern I wanted to knit, but I found it today! Do you ever have a picture in your head of the thing you know will suit someone and then it’s really hard to find that exact pattern? That was me, looking for Gemma. So happy that Hilary Smith Callis came up with the pattern I wanted! This is Little Wool Co.’s pure wool in DK. The colour is Damson. Hope to have something pretty to show you soon. Categories: Finished Objects, Knitting, Sock yarn, Wool, yarn | Tags: fair isle, Knitting, Little Wool Co., socks, Wool | Permalink.